Get your multicolored Giant Car Bow in two color combos by choosing either Red/Green or Red/White/Blue to make your cars look amazing. 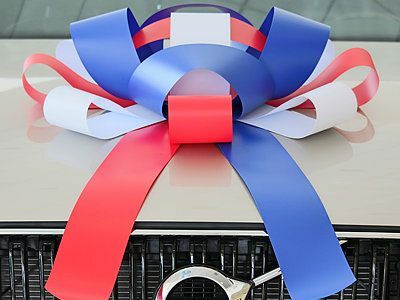 The Multicolored Giant Car Bow Ribbon is available in a choice of two color combinations: Red/Green and Red/White/Blue. 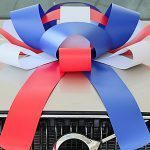 If you know you want a Large Car Bow for your vehicles but you want something that will be even more eye-catching, choose one of our multi-colored bows. 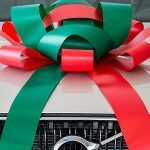 Available in two color combinations of Red/Green and Red/White/Blue, this giant bow is the perfect way to make sure everyone notices the cars in your dealership. Presenting a car to someone special, perhaps as a birthday gift? Choose their favorite colors for your bow and make sure your gift looks spectacular when you present it to them. The magnetic back means there is no risk of scratches, and the vinyl material means you can even use it in the rain. There is no more colorful way to perfectly present your cars than with this multi-colored Giant Car Bow. We offer an extensive range of car bows at our store, so explore our Graduation Car Bows, Birthday Car Bows, Blue, Red, Black, and White Bows, Suction Cup Car Bows, and Pull Bows to find exactly what you need. Benefit from fast delivery of your car bow when you buy from us. We’ll get your order back to you at any address in the USA in 1-5 days when you choose expedited shipping at checkout. JumBow Customization - Customize your JumBow!